NEW DELHI: Jammu & Kashmir police have identified a 48-year-old Lashkar-e-Taiba recruiter and management graduate, who crossed over to Pakistan five years ago, as the key conspirator behind the assassination of senior Kashmiri journalist Shujaat Bukhari. According to intelligence sources, the mastermind, Sajjad Gul, is a native of Kashmir who did his MBA from a private institution in Bangalore and is now settled in Rawalpindi, Pakistan. The “kill” order came from LeT chief Hafiz Saeed and Gul assigned the job to local militants he personally selected. Bukhari, editor-in-chief of Srinagar-based English daily Rising Kashmir, had angered Lashkar and other Pakistan-controlled terror groups by supporting the Ramzan truce announced by the Centre + . Sources said his murder was part of a larger plot, prepared in March after the appointment of former Intelligence Bureau chief Dineshwar Sharma as J&K interlocutor, to target those who supported efforts for peace. “The order to execute Bukhari was given by the Lashkar-e-Taiba chief and only an extremely small group of members was involved,” an intelligence officer told TOI. Gul, he said, was asked to recruit local militants to kill Bukhari. Sources said besides having a management degree, Gul had also trained as a laboratory technician before he turned to terrorism. He was actively involved in terror-related activities. According to his police file, he was caught and was lodged in Srinagar Central Jail and Delhi’s Tihar Jail before escaping to Pakistan. “His first-hand knowledge about native journalists came handy for the Lashkar-e-Taiba,” a source said. J&K interlocutor Sharma held meetings with as many as 16 groups, reaching out to families of policemen, tribals, hawkers, drivers and journalists who were killed in terror attacks as well as kin of those who had been lured into joining Lashkar and other terror groups over the past five years. Sharma’s moves caused consternation to Saeed and his commanders who passed instructions to thwart the Centre’s initiative. 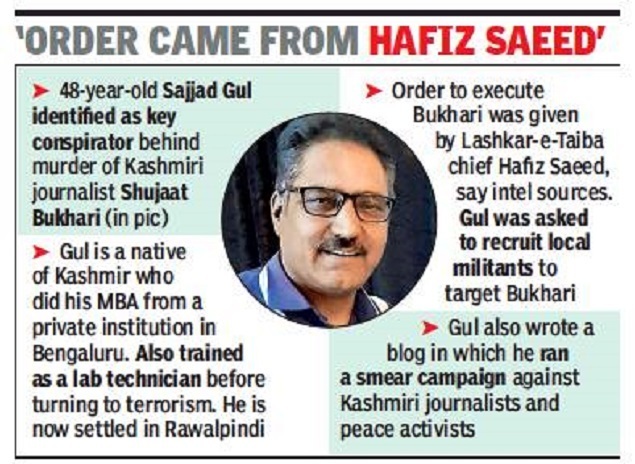 Sources in agencies and police said Gul set up a blog where he ran a smear campaign against Bukhari and marked many of his targets, including other Kashmiri journalists, peace activists and former RAW officers. The IP addresses of the blog were found to be “spoofed” and routed via Europe and the US. “Eventually, we located the IP address in Bahawalpur, Punjab of Pakistan,” a source in Delhi said. “There is... no doubt that the conspiracy was hatched in Pakistan after clear instructions from Hafiz Saeed,” he added. J&K police, however, denied on Wednesday that they had cracked the case and refused to divulge any details.